'herman de vries. lavande', April 8-November 3, 2011. 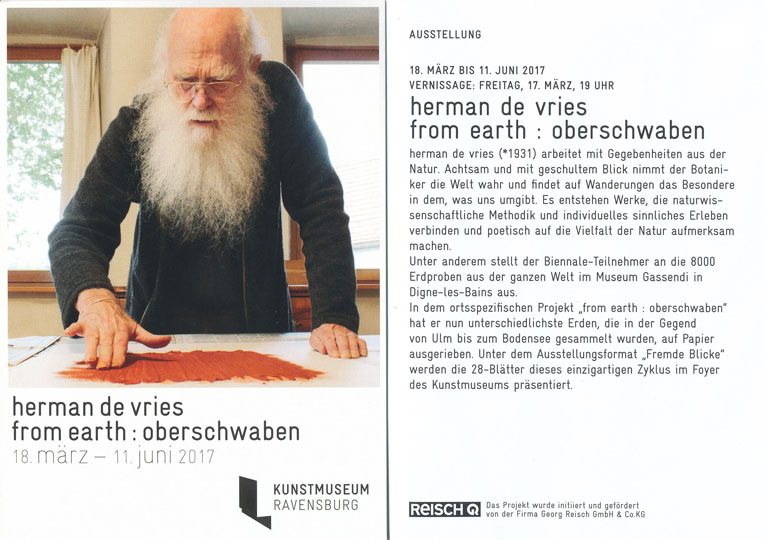 'herman de vries', May 6-July 2, 2011. 'herman de vries 80 jaar', July 11, 2011-February 29, 2012. 'herman de vries. homogeen & heterogeen', August 21-September 11, 2011. 'i am - Diepenheim eert herman de vries eert Diepenheim', September 9-25, 2011. Curated by Cees de Boer. 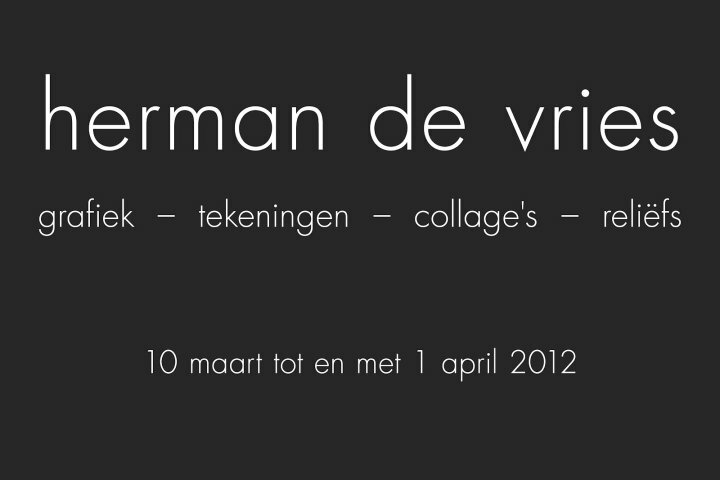 'to be / herman de vries / verzamelingen', September 9, 2011-January 8, 2012. 'herman de vries. werke aus der wirklichkeit', October 14-November 26, 2011. 'herman de vries', November 18-December 17, 2011. 'pièces manquantes / appel à cotisations', February 12-June 25, 2011; 'petite histoire chuchotée d'une collection : poésies concrète, visuelle (pour mémoire)', 15th February-16th April, 2011 and 'petite histoire chuchotée d'une collection : pour information 1 (passe à ton voisin)', April 20-June 25, 2011. 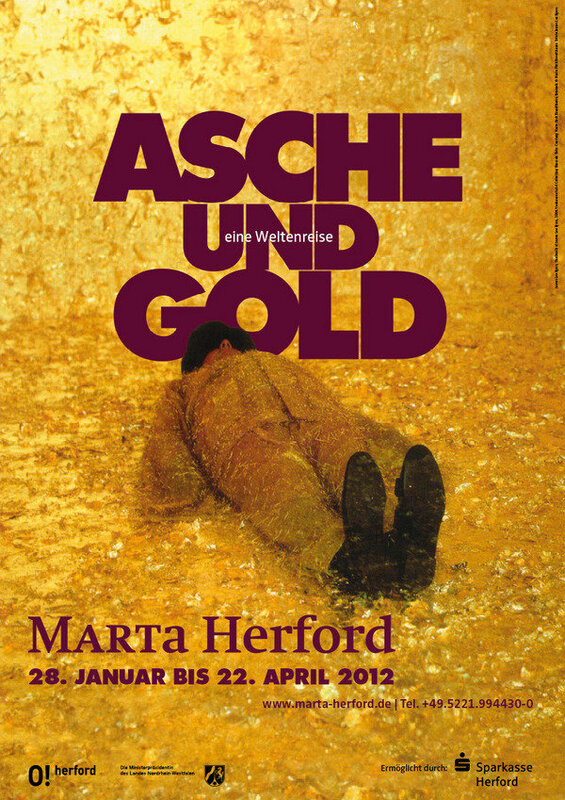 'Farbe als Thema', February 8-March 31, 2011. 'The Temporary Stedelijk 2', March 3-May 8, 2011. From 28 March to 4 April Galerie Aline Vidal shows 'ashes of joy' at the Salon de Dessin 2011, Paris. 'Galerie Lydia Megert – "mise au point"', April 8-21, 2011. 'Gingko Sempervirens', May 1-October 30, 2011. 'Personal Structures', Palazzo Bembo, June 1-November 27, 2011. 'Arts Psychoactifs', June 23- August 27, 2011. Curated by Antoine Perpère. 'herman de vries 80, nul=zero and contemporaries', September 9-October 22, 2011. 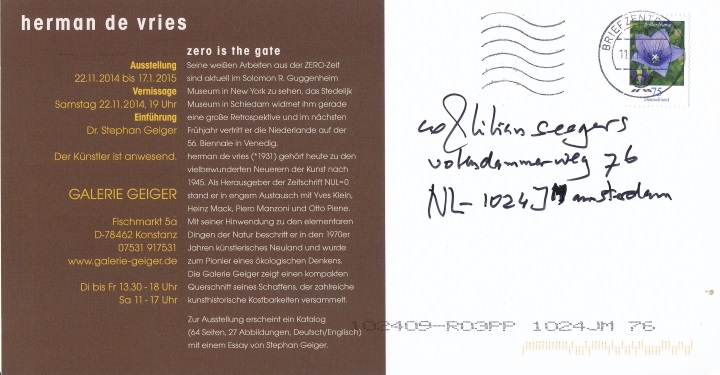 'nul = 0 : dutch avant-garde in an international context, 1961-1966, September 11, 2011-January 22, 2012. 'nul = zero', September 17-November 12, 2011. 'Laubwerk - Astwerk', September 24-December 18, 2011. 'Na Nul / After Zero', November 12-December 3, 2011. 'herman de vries. transit', March 3-April 20, 2012. 'herman de vries', March 10-April 1, 2012. In the exhibition prints, drawings, collages and reliefs from the 60s and 70s. 'herman de vries. "every thing is all ways significant for all"', March 16-May 5, 2012. [with Horst Ziegler] 'herman de vries. neue arbeiten', April 29-May 20, 2012. Official opening 'De Tuinen van Diepenheim', May 26, 2012. 'drawings 2012 & two stones', September 7-October 27, 2012. 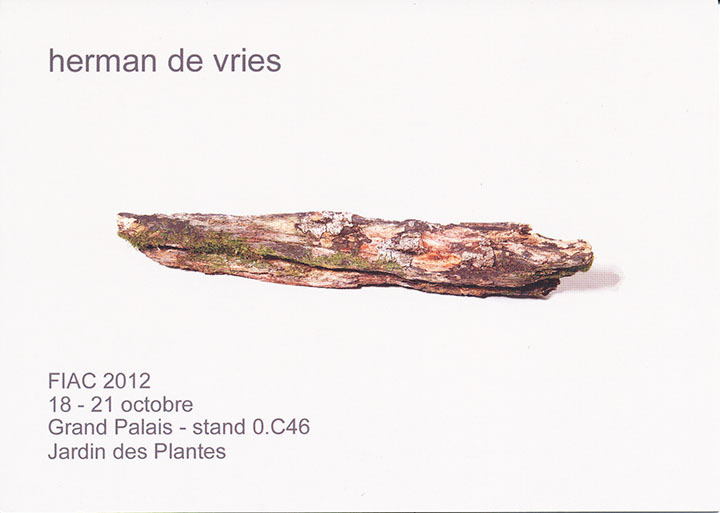 Galerie Aline Vidal presents herman de vries at the FIAC 2012, October 18-21, 2012 and in the Jardin Des Plantes/National Museum Of Natural History. 'herman de vries. diversity in unity', October 6, 2012-January 10, 2013. 'Spirits of Internationalism. 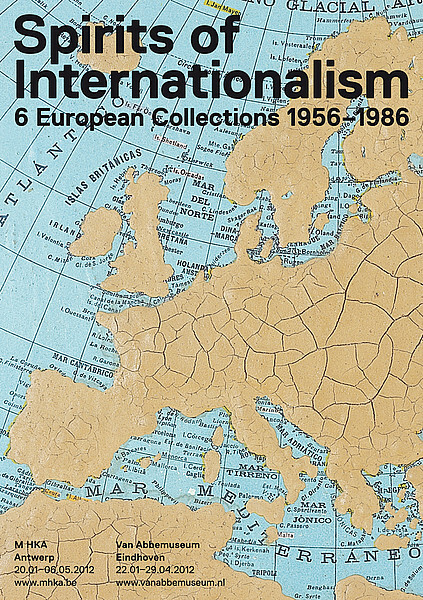 6 European Collections 1956-1986', January 20-May 6, 2012. Curated by Bart De Baere, Jan De Vree, Anders Kreuger. 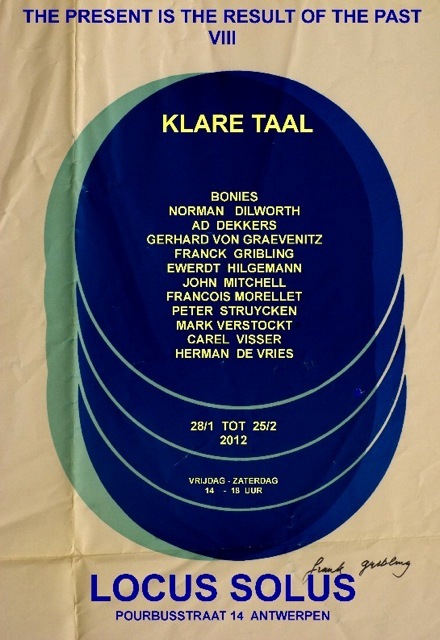 'Klare Taal (Hommage aan Riekje Swart)', January 28-February 25, 2012. Curated by Frank Gribling. 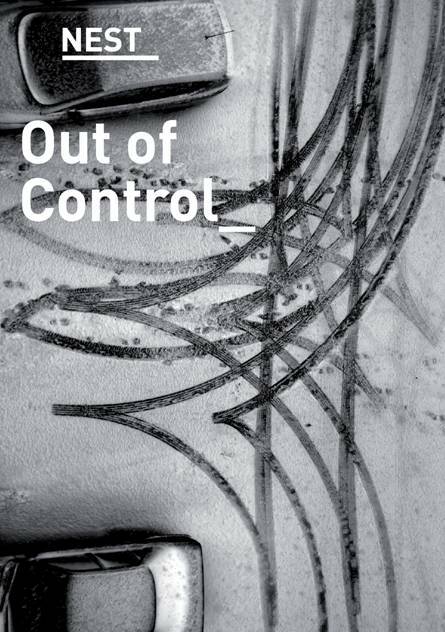 'Out of Control', January 29-March 4, 2012. 'Asche und Gold. Eine Weltenreise', January 28-April 22, 2012. Part of the exhibition (without herman de vries) toured to Bedburg-Hau. 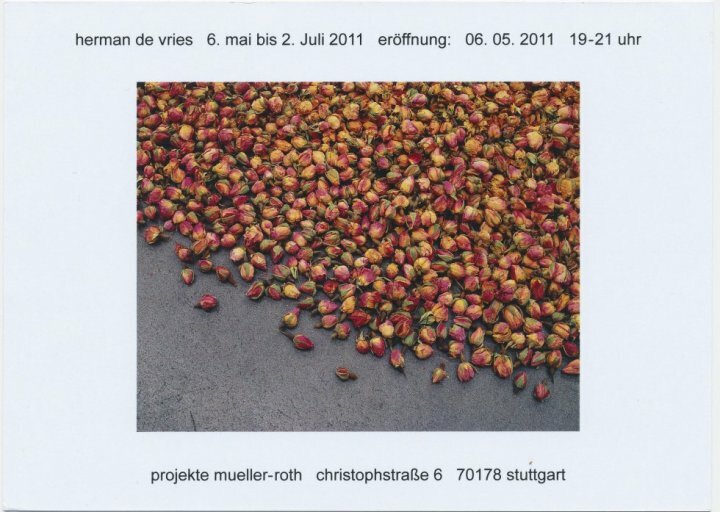 'Review - Werke aus der Kunsthaus-Sammlung CentrePasquArt', April 1-June 17, 2012. 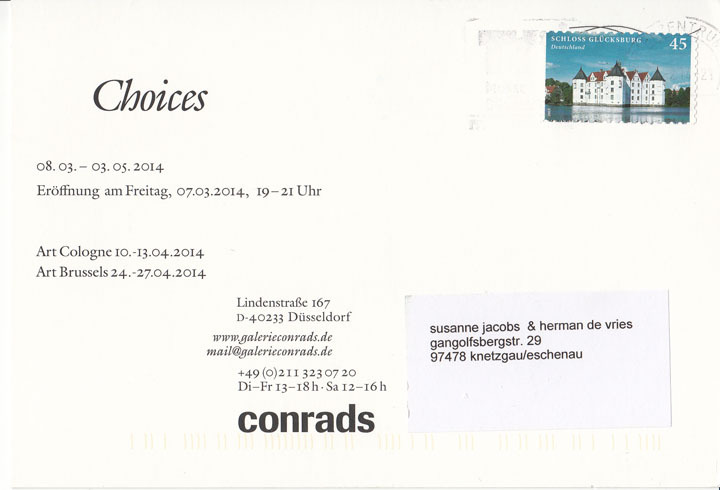 Curated by Betty Stocker and Irène Zdoroveac; participating artists M.S. Bastian, Daniel Berset, Roman Buxbaum, herman de vries, and others. 'Verlangen naar volmaaktheid - 21 jaar verzamelen door het Kröller-Müller Museum', April 1- October 28, 2012. 'Ab in die Ecke! ', May 5-August 12, 2012. 'L'art concret, né en Europe', May 20-end of 2012. 'herman de vries and contemporaries. Works on paper, Artists Books and Artists Publications (1959 – 2011)', July 2012. 'Explorateurs. Oeuvres du CNAP Centre National des arts plastiques', July 8-November 10, 2012. 'Ton, Steine, Erden. Helmut Dirnaichner, Hamish Fulton, Romuald Hazoumé, Karin Sander, Giuseppe Spagnulo, herman de vries', September 15-October 27, 2012. 'Créa'Fictions (1/3)', October 16-December 19, 2012. '"Confusion will be my Epitaph". Enrichissements de la collection 2011-12', October 27, 2012-March 16, 2013. 'Spécimens. Collections, croisements, sentinelles', November 25, 2012-March 31, 2013. 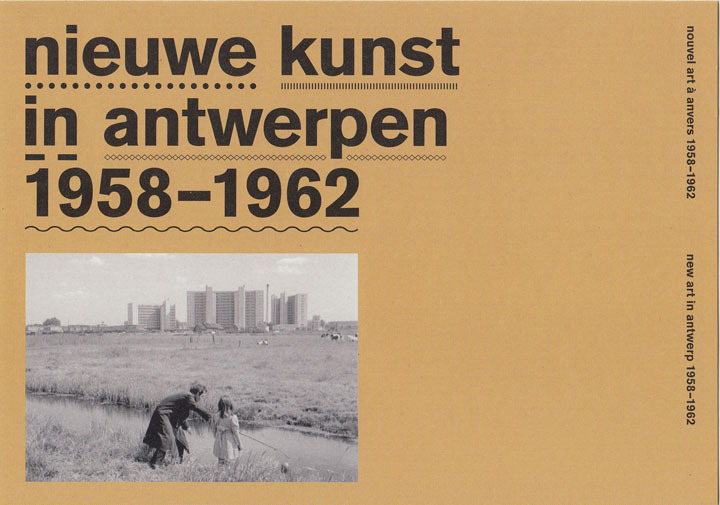 'Nieuwe kunst in Antwerpen 1958-1962. Maar het zelf zien', December 7, 2012-February 10, 2013. Curated by Jan Ceuleers, in cooperation with Ronny Van De Velde. 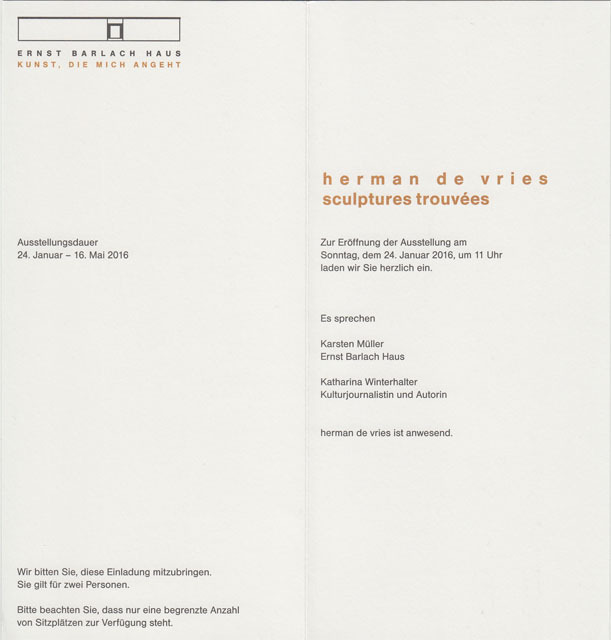 'herman de vries', January 23-March 7, 2013. 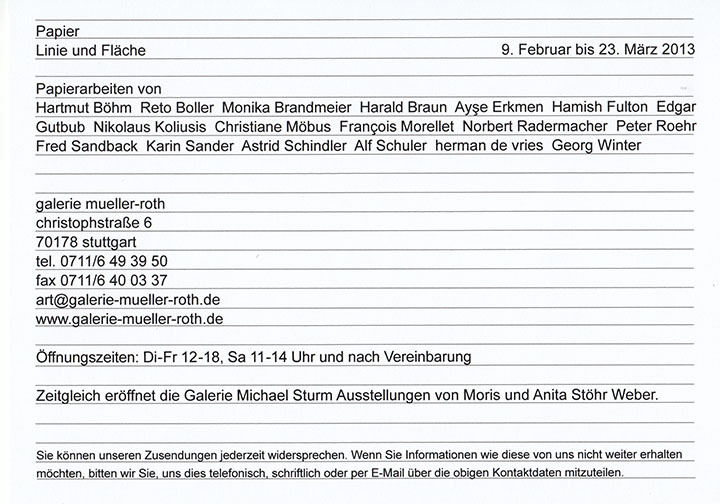 [with Manfred Holtfrerich, Ingolf Timpner] 'Blatt für Blatt', March 19-May 11, 2013. 'herman de vries. the undefined – everywhere', October 20, 2013-January 19, 2014. [with Carlijn Mens] '"traces". herman de vries en Carlijn Mens', November 8-December 15, 2013. Opening speech by Lisette Pelsers, Kröller Müller Museum. The artists also showed work on the campus of Wageningen University. 'herman de vries. boeken en edities = herman de vries. . books and editions', library exhibition, November 10, 2013-January 10, 2014. At the opening the publication die wiese / the meadow 1986-2013 will be presented. Opening speech by Cees de Boer. 'De kunst van het verzamelen. Keuze uit de collectie van Sjoerd Buisman', January 5-February 10, 2013. 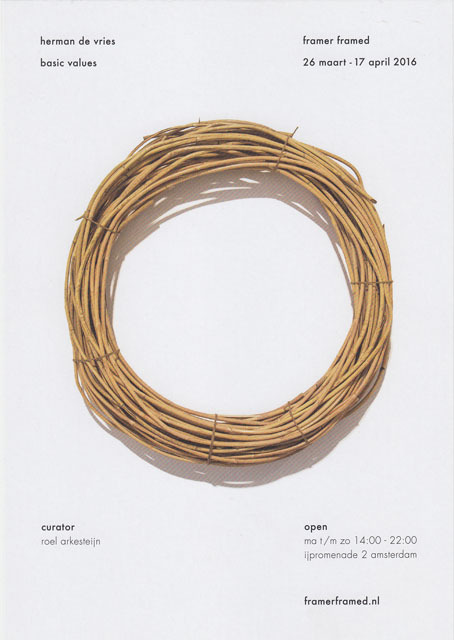 'Collectie Manders – Naar eenvoud en verstilling', January 27-May 20, 2013. 'Junges Museum : Indigo – Ocker – Zinnober. Warum Farben Namen haben', January 27-July 14, 2013. 'Papier - Linie und Fläche', February 9-March 23, 2013. 'Gebaute Bilder. Werke aus der Sammlung Hupertz = Constructed Images. Works from the Hupertz Collection', February 10-May 26. 'Arts sous Influences', February 15-May 19, 2013. Curated by Antoine Perpère. 'all this here / tout est là', March 7-May 19, 2013. Curated by Pauline Guelaud. 'S(ch)ichtwechsel! Neue Blicke auf die Sammlung', March 17-May 26, 2013. 'L'arbre qui ne meurt jamais', March 22-June 30, 2013. 'Esthétique du livre d'artiste. Collections et inventaires', March 23-May 26, 2013. Curated by Anne Moeglin-Delcroix. Exhibition based on the collection of the FRAC (Livres, Éditions et Multiples d'artistes). 'Ma p'tite folie contemporaire', May 2-June 24, 2013. 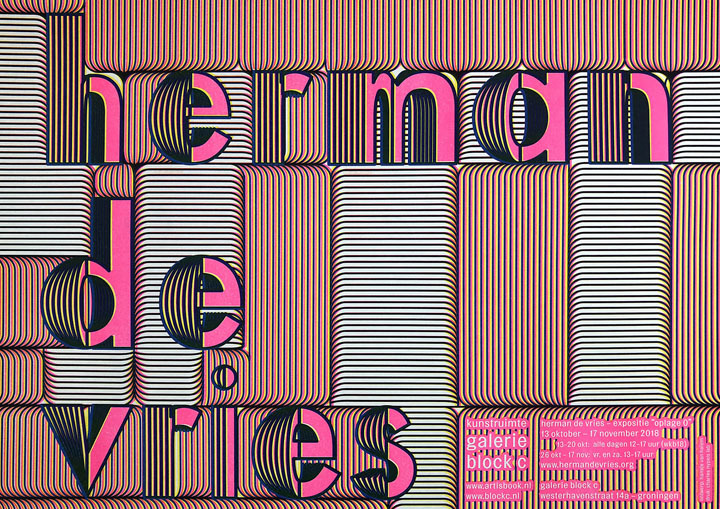 'Ulysses, l'autre mer', May 17-August 25, 2013. '#FFFFFF #000000', May 22-June 22, 2013. Curated by Mehdi-Georges Lahlou and the Cabinet du livre d’artiste. 'Personal Structures', Palazzo Bembo, June 1 - November 24, 2013. Curated by Karlyn de Jongh and Sarah Gold. 'Time, the deer, is in the wood of Hallaigh/Tha tìm, am fiadh, an Coille Hallaig', 6-11 June, 2013. 'Viagem ao fim da cor. livros e obras impressas', July 6-November 3, 2013. Participating artists Robert Barry, Daniel Buren, James Lee Byars, herman de vries, and many others. 'L'art en lieux > l'espace d'un jardin. Collections de l'Artothèque du Limousin', at the "L’Atelier", place de la Mayade, Royères-de-Vassivière, June 28-September 15, 2013. In cooperation with the Centre des livres d'artistes, Saint-Yrieix-la-Perche. 'Original Drawings on Paper', September 13-October 18, 2013. 'B.A.B.E — The Best Artists Books and Editors', September 20-October 26, 2013. 'es werde farbe', September 28/29, 2013-April 5/6, 2014. 'Oplagen, 1/X , 2/X , ... X/X , X = 1 , 2 , ... X : Alicja Werbachowska, Aline Eras, Andre Pielage, [...]', September 29-October 27, 2013. 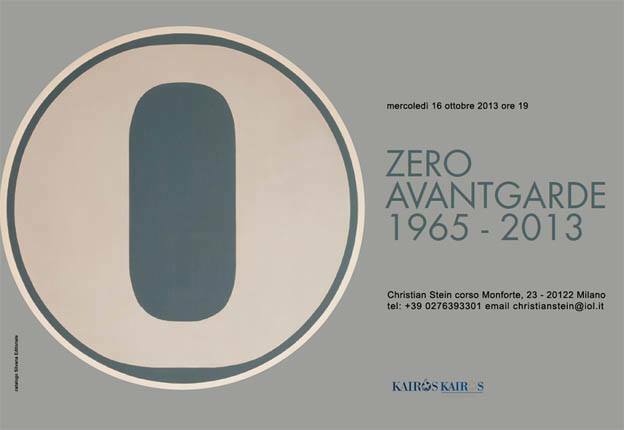 'Zero Avantgarde 1965-2013', October 16, 2013-January 11, 2014. Curated by Nanda Vigo in collaboration with Galleria Christian Stein. 'Remuer ciel et terre. Alighiero e Boetti, Marinus Boezem, Christian Boltanski, [...]', November 8, 2013-February 8, 2014. In cooperation with the centre des livres d'artistes, Saint-Yrieix-la-Perche. 'Wonder', November 12, 2013-March 16, 2014. 'Zeitlos gut!, November 23, 2013 – January 8, 2014. 'Mina, reconstructie van een decennium', December 14, 2013 – March 2, 2014. Curated by Gijs Assmann and Hanne Hagenaars. Installation by Miek Zwamborn with participating artists: Sjoerd Buisman, Anne Geene, herman de vries, and others. [with Benoît Pype] 'minimae', April 30-June 25, 2014. Curated by Aurélie Tiffreau. 'chance & change', May 2-June 27, 2014 (until August 1, 2014). 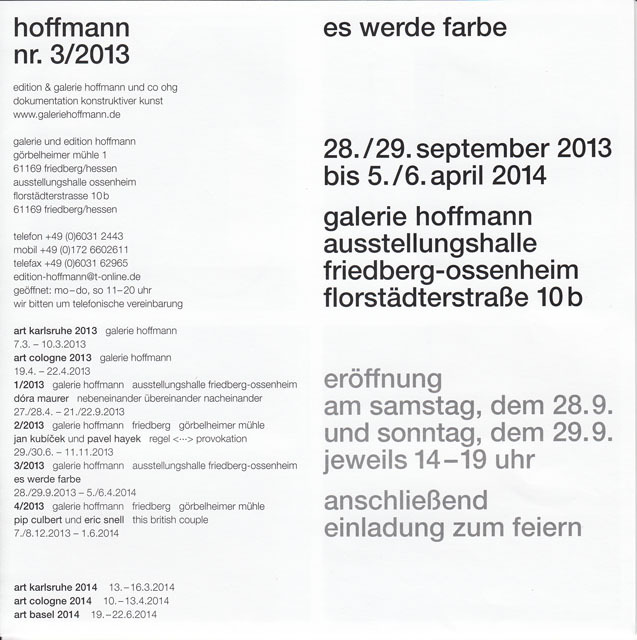 'aus der heimat, erdausreibungen 1992-1993, in Galerie², May 18-October 19, 2014. Presentation of the work 'aus der heimat' (1992), donated by herman de vries. 'Bodem en Kunst', May 23-July 11, 2014 (by appointment). 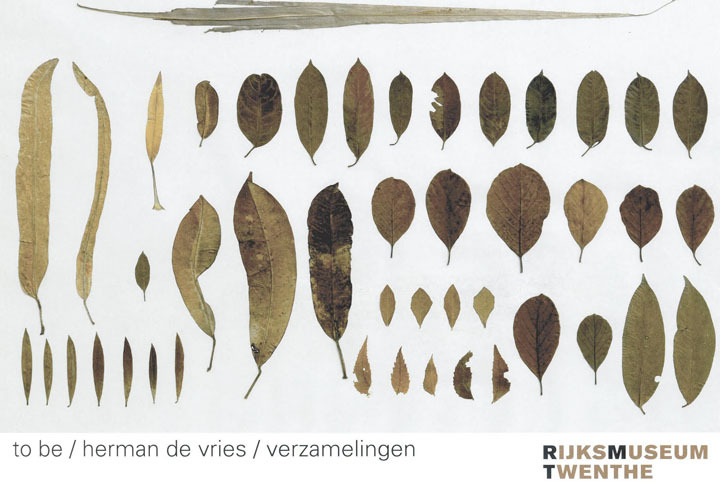 Besides earth rubbings, archive material of herman de vries' research in Wageningen will be on view. 'all', September 20, 2014-January 25, 2015. Curated by Colin Huizing. 'no thing', September 20, 2014-January 25, 2015. 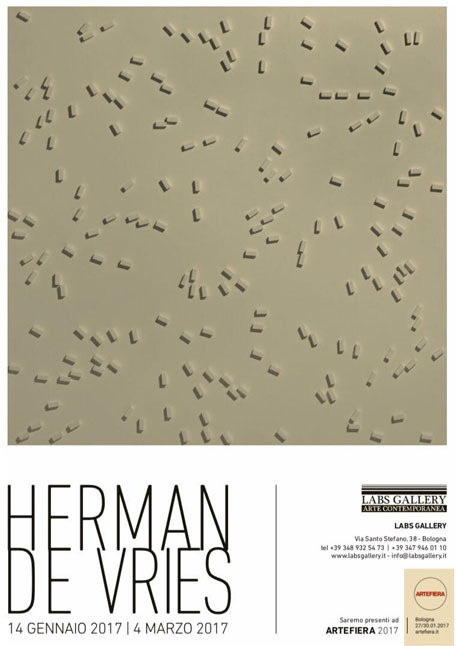 'from stock : herman de vries', September 25, 2014-January 24, 2015. Galerie Wit, Wageningen presented herman de vries at the fair Art The Hague, October 1-5, 2014. October 4, Aldwin Kroeze gave a lecture on herman de vries. 'the poet in his poetry', Ottenhuis Diepenheim, October 9-19, 2014. Exhibition on the occasion of the inauguration of 'the waterlilies. remembering gustav theodor fechner (1801-1887)' [= de waterlelies. herinneringen aan gustav theodor fechner (1801-1887)] at peckedam manor on the nijenhuis estate, diepenheim, october 10, 2014. 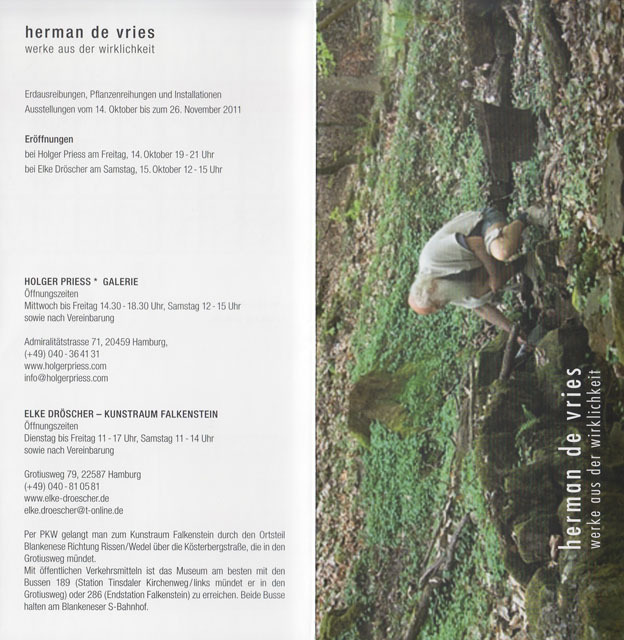 'herman de vries books and editions', November 14-15, 2014. Solopresentation during the Small Publishers Fair, curated by Peter Foolen Editions and herman de vries. 'herman de vries. zero is the gate', November 22, 2014-January 17, 2015. 'Second Nature', February 15-April 13, 2014. 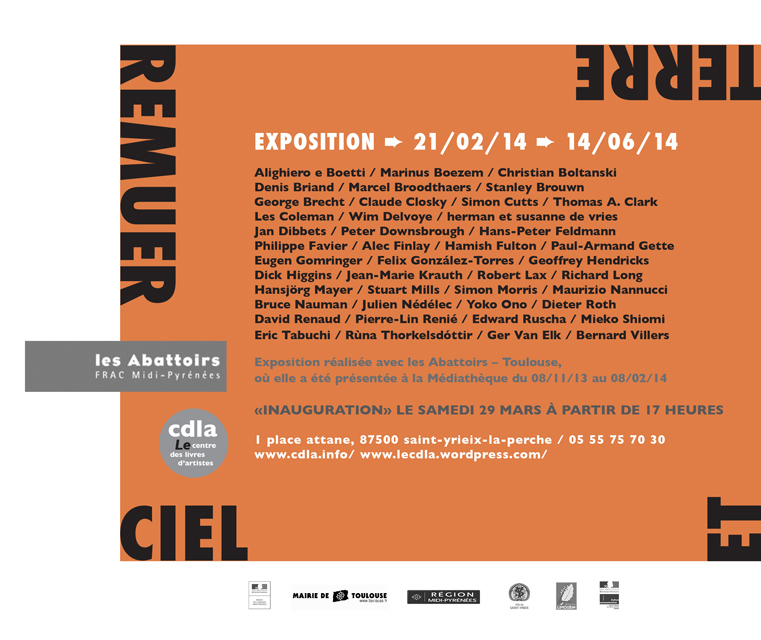 'Remuer ciel et terre', February 21-June 14, 2014. A collaboration between le Centre des livres d’artistes and les Abattoirs – FRAC Midi-Pyrénées. The exhibition takes as a starting point Luke Howard’s On the modification of clouds, a text published in 1803 in which the author lays the foundation for cloud classification. 'Manifestation Caravana Negra', February 25-May, 2014. Created by the French designer Stéphane Plassier. 'L'Herbier: marcher, classer, nommer le paysage', March 3-August 31, 2014. Group exhibition organized by the Écomusée de l'Avesnois, with herman de vries, Frédéric Fourdinier, Sébastien Gouju, Richard Long and Mira Sanders. 'Choices. Works on paper', March 8-May 3, 2014. 'Van Picasso tot Sol LeWitt. Het kunstenaarsboek na 1950', March 15-July 13, 2014. Curated by Hans and José Brokken. 'nothing to see nothing to hide = nothing to say nothing to conceal', March 25-29, 2014. Curated by Frank Mandersloot. Artists' books and printed matter. 'Drawing Now Paris Edition 10', March 30-April 3, 2014. 'No Show Museum' is an independent online archive dedicated to the documentation, preservation and presentation of the art of nothing. 'Description et collecte', April 3-May 30, 2014. 'Löwenzahn', April 12-June 29, 2014. 'Le pas et la page. 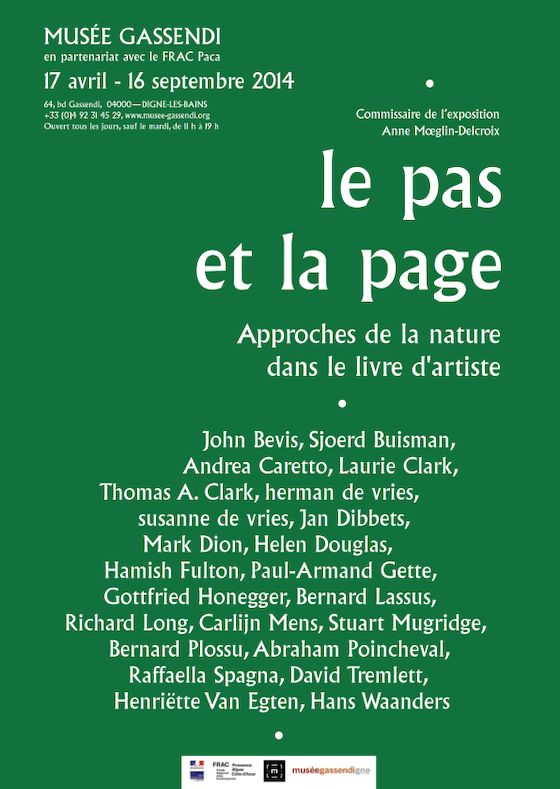 Approches de la nature dans le livre d'artiste', April 17-September 16, 2014. Curated by Anne Moeglin-Delcroix in co-operation with the FRAC PACA. Selection of works by John Bevis, Sjoerd Buisman, Andrea Caretto, Laurie Clark, Thomas A. Clark, herman de vries, susanne de vries, and others. The exhibition travelled to Marseille (March 21-June 6, 2015). 'against Nature. Print exhibition exploring geography, the geo-graphical, natural histories and landscapes', April 22-May 30, 2014. Curated by Finlay Taylor, participating artists Franz Ackermann, Jasone Miranda Bilbao, Sarah Bodman, herman de vries, and others. 'KÜNSTLERBÜCHER _ ARTISTS' BOOKS. Internationale Exponate von 1960 bis heute', May 1-November 2, 2014. Curated by Michael Braunsteiner and Barbara Eisner-Braunsteiner. Selection from the collections of the Bayerische Staatsbibliothek, Munich, Museum Angewandte Kunst, Frankfurt am Main, mumok Museum Moderner Kunst Stiftung Ludwig Wien, Vienna, and other museums in Germany and Austria. May 15-June 21, 2014, organized by Galerie Aline Vidal, Paris. 'Choices. Large Scale', May 22-July 12, 2014. 'Paysages contemporains. Oeuvres de la collection du Frac Bretagne', June 14-July 27, 2014. 'Le Mur. La collection Antoine de Galbert', June 14-September 21, 2014. '10 ans de la Donation Albers-Honegger', opening June 20, exhibition on view June 21, 2014 onwards. Curated by Fabienne Fulchéri, Alexandra Deslys and Claire Spada. 'Freundliche Übernahme. Künstler zeigen ihre Sammlung', June 28-October 5, 2014. 'OPENthewoods#arboretum Videokunst in het Von Gimborn Arboretum', July 5-6, 2014. 'On Paper - Zeichnungen von Künstler der Galerie', September 2014. Works by Martin Assig, Stephan Balkenhol, Jochen Flinzer, Olav Christopher Jenssen, Claudia Pegel, Peter Rösel, David Tremlett and herman de vries. 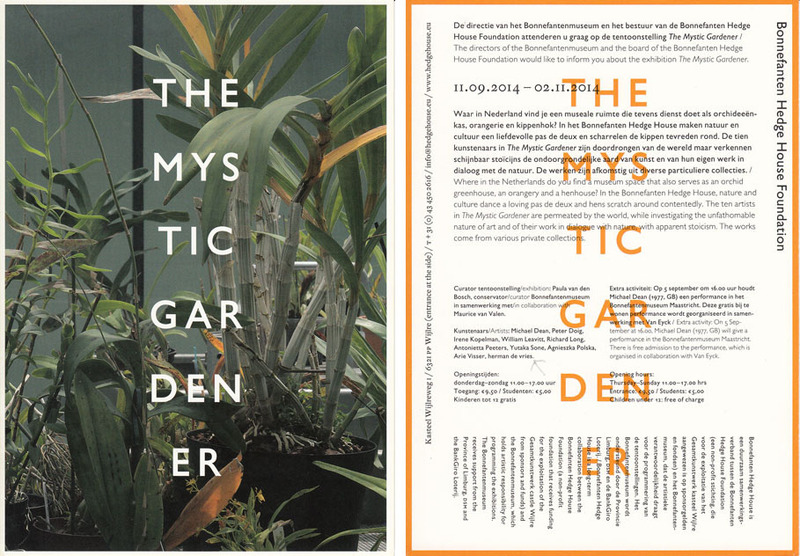 'The Mystic Gardener', September 11-November 2, 2014. Curator exhibition: Paula van den Bosch, curator Bonnefantenmuseum in collaboration with Maurice van Valen. 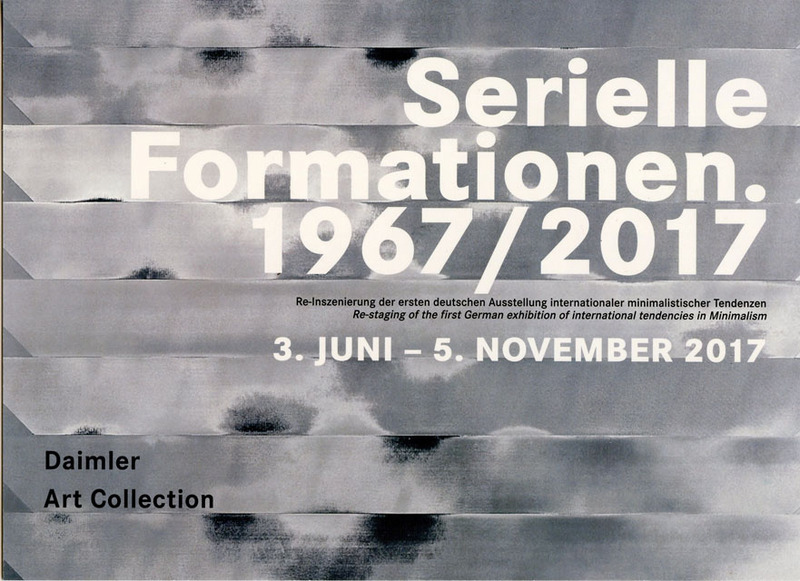 '10 Jahre Hubertus Schoeller Stiftung', September 14-November 23, 2014. 'ZERO. Countdown to Tomorrow, 1950s–60s', October 10, 2014–January 7, 2015. 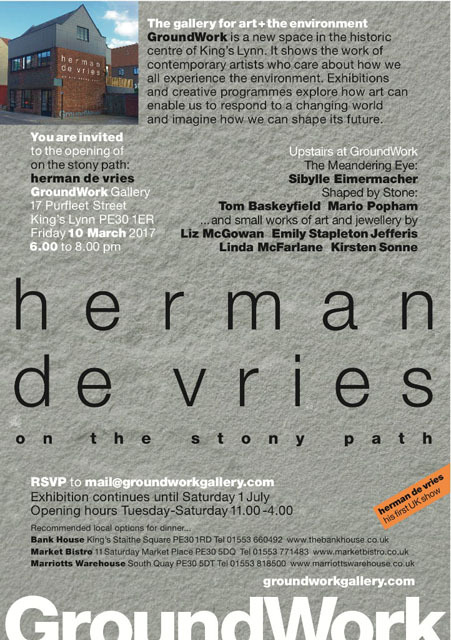 Curated by Valerie Hillings, with Edouard Derom. The exhibition travelled to the Martin-Gropius-Bau, Berlin and the Stedelijk Museum Amsterdam. '10 jaar Wit. 40 kunstenaars op 10 bij 10', October 10-November 16, 2014. Participating artists Alicja Werbachowska, Aline Thomassen, Alrik Stelling, and others. 'Weiß - Aspekte einer Farbe in Moderne und Gegenwart', November 8, 2014-February 22, 2015. The exhibition comes from the Ruppert Collection in the Museum im Kulturspeicher. 15 pictures and objects included in the exhibition form the basis for this project and are by artists such as Andreas Christen, Ad Dekkers, Leo Erb, Norbert Kricke, Jan Schoonhoven, herman de vries and Günther Uecker. 'Unikat – Unicum. Artists' books from the Prints and Drawings Department', November 22, 2014-February 28, 2015. Curated by Susanne Bieri and Andrea Giger. 'herman de vries. imprimés, livres et autres publications', February 10-June 6, 2015. 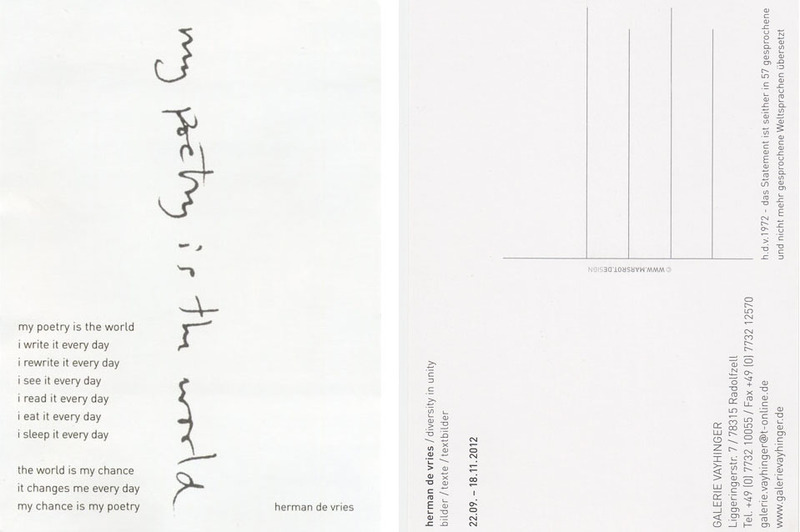 'herman de vries - à mes pieds', April 1-June 21, 2015. Curated by Nadine Gomez. 'herman de vries. to be all ways to be', May 9-November 22, 2015. This year herman de vries will represent the Netherlands at the Venice Biennale. The exhibition will be curated by Cees de Boer and Colin Huizing and is commissioned by the Mondriaan Fund. 'natural relations. artists' books by herman de vries from the collection of frank mandersloot', May 26-June 18, 2015. 'herman de vries. toevalstekeningen 1970-1975', June 6-September 20, 2015. Curated by Lilian Seegers. 'Summer Show I', June 15-August 31, 2015. 'herman de vries - L'Art Zéro', June 21-September 13, 2015. During this period also work by Ger van Elk and Sigurdur Arni Sigurdsson is shown. 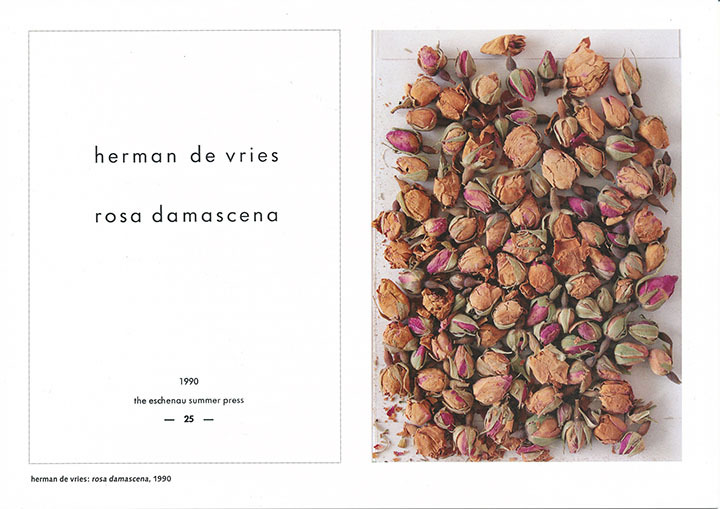 'herman de vries 1960 – 1995. kunstenaarsboeken, collages, gemengde technieken en video', September 20, 2015-January 10, 2016. 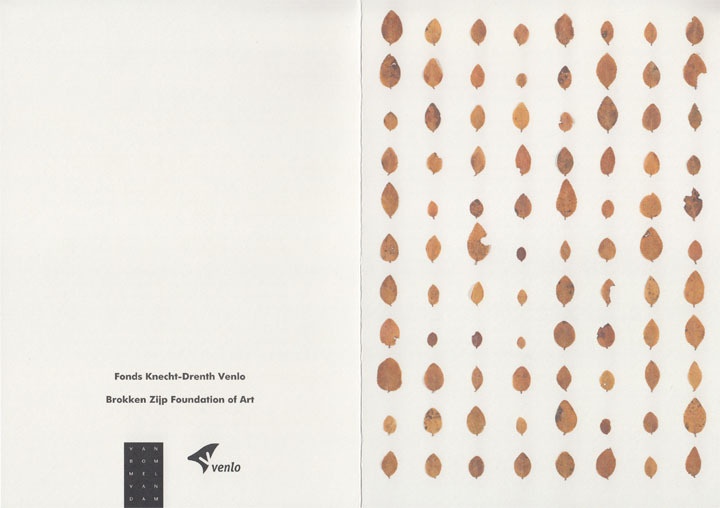 Curated by Hans and José Brokken-Zijp and showing works and artists' books from the Brokken Zijp Foundation of Art (BFA). 'Ideenreich', September 23-November 6, 2015. The exhibition is part of the project "Kunststück!" 2015. Participating artists Ludwig Heinrich, herman de vries, Heinz und Jannina Hector, and others. 'herman de vries. zufall : werke von 1965 bis 2015', October 17/18, 2015-March 13, 2016. 'herman de vries. zeichnungen', October 18-November 8, 2015. 'herman de vries. basic values', November 9, 2015-January 17, 2016. Curated by Roel Arkesteijn. The exhibition travelled to Amsterdam (March 26-April 17, 2016) and to Sittard (June 12-September 4, 2016). 'herman de vries. venice and beyond', November 14-December 19, 2015. 'herman de vries. Finissage Venice Biennial', November 26-29, 2015. 'Aanwinsten 2013-2014', January 7- March 18, 2015. 'Le Pas et la Page. Approches de la ville et de la nature dans le livre d’artiste', March 21-June 6, 2015. In cooperation with Musèe Gassendi, Digne-les-Bains. Curated by Anne Mœglin-Delcroix and Pascal Neveux. The exhibition was also on view in Digne-les-Bains (2014). 'ZERO - the international art movement of the 1950s and 1960s', March 21-June 8, 2015. Organized by the ZERO foundation in cooperation with Berliner Festspiele/Martin-Gropius-Bau. Part of the exhebition has beeen shown from october 2014 onwards in New York. 'different - identical', March 28-May 10, 2015. Double exhibition with Galerie im Saal, Eschenau (April 12-May 3, 2015). Participating artists Martin J. Allen, herman de vries, Sylvia Peter. 'De Gouden Eeuw van Twenthe', April 18 onwards. 'Être et Avoir #2. La collection de Hubert Duprat / La collection de Natacha Pugnet et Fabien Faure', April 30-May 29, 2015. 'Personal Structures. Crossing Borders', May 9-November 22, 2015. 'Atmosfera ZERO. Great Expectations #2', May 16-July 18, 2015. Curated by Marco Meneguzzo. 'Waterbound – Vom Leben mit dem Wasser', May 22-August 30, 2015. Exhibition in cooperarion with the Neue Galerie, Dachau. 'Our Artists, Our Friends - 40 Jahre Galerie Geiger', May 23-July 11, 2015. 'Uit liefde voor hout van MIJ, van IJsselsteinse meubelindustrie tot Gerrit Rietveld en herman de vries', June 20-September 27, 2015. 'Veldwerk. 25 Jaar Kunstvereniging Diepenheim', June 27-September 6, 2015. 'My first Summer in the Sierra – Works from the Centre national des arts plastiques', June 28-December 6, 2015. Curated by Sébastien Faucon and Xavier Franceschi. 'ZERO. Let us explore the stars', July 4-November 8, 2015. Curated by Margriet Schavemaker; with work by herman de vries, Arman, Armando, Bernard Aubertin, Pol Bury and many others. 'In de luwte van de tussentijd [= in the lee of the in-between]', July 4-August 30, 2015. 'Ich bin eine Pflanze. 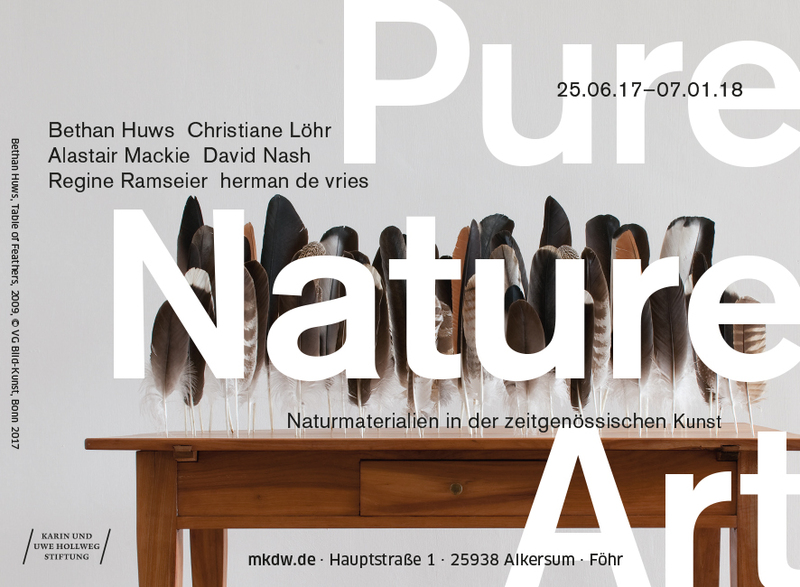 Naturprozesse in der Kunst', July 11-November 8, 2015. 'Young Collector's Choice 15', July 18-August 22, 2015. Participating artists Rupprecht Geiger, Heinz Mack, Daniel Spoerri, herman de vries and others. 'Ansichten XXIII "natural affairs"', September 5-November 1, 2015. Curated by Christel Schüppenhauer; presented artists herman de vries, Ulrike Arnold, Ragna Robertsdottir, and others. 'À bout de soufle', September 10-October 1, 2015. Curated by Ilaria Bignotti; participating artists Alighiero Boetti, Agostino Bonalumi, Dadamaino, Lucio Fontana, Walter Leblanc, Heinz Mack, Giulio Paolini, Henk Peeters, Otto Piene, Günther Uecker, herman de vries. 'Longing for Happier Times. Mediakunst uit de collectie van het Kröller-Müller Museum', September 19, 2015-January 3, 2016. Participating artists Willie Doherty, Mario Garcia Torres, Jan Fabre, Cai Guo-Qiang, Matt Mullican, Hetty Huisman en herman de vries. 'SoilCulture: Deep Roots', organized by the Centre for Contemporary Art and the Natural World, September 19-November 21, 2015. Participating artists Paolo Barrile, Mel Chin, herman de vries, Richard Long, Ana Mendieta and Claire Pentecost. The exhibition will tour to Peninsula Arts, Plymouth University 16 January-19 March 2016. 'Sagen und Zeigen | Schrift in der Kunst', September 26-November 8, 2015. Participating artists Michaela Eichwald, Jochen Flinzer, Eugen Gomringer, Michael Hakami, Albert Hien, Nanne Meyer, Dietmar Pfister, herman de vries, and others. 'NulNu', October 11-November 8, 2015. Organized by Yssel Centre for Contemporary Art (YCCA) and curated by Anna Oele; participating artists Annesas Appel, Lu Xinjian, herman de vries and Henk Peeters. 'Zeitlos Gut! ', October 31-December 31, 2015. 'Iconographie. L'oeuvre comme collection d'images, November 20, 2015-March 5, 2016. Works from the collections of the Centre des livres d'artistes, of the Frac and the Artothèque du Limousin. Participating artists Jean-Daniel Berclaz, Christian Boltanski, Philippe Clerc, Claude Closky, herman de vries, and many others. 'Zicht op Zee', November 14-December 14, 2015. Organised by Triple A Projects, The Hague. 'Galerie Wit at Witteveen #8', November 19-December 5, 2015. Participating artists herman de vries, Nan Groot Antink, Joos van de Plas, Flos Pol. 'Dark Ages', November 20, 2015-January 9, 2016. Participating artists herman de vries, Carlos Aires, Francis Alys, Ryuta Amae, and many others. 'Silence out loud', December 15, 2015-June 12, 2016. Exhibition curated by Joost Zwagerman. Participating artists hertman de vries, Ad Dekkers, Amie Dicke, Anke Roder and many others. 'herman de vries. Kohleausreibungen', January 24-April 2, 2016 (the exhibition was extended until April 23). 'herman de vries. sculptures trouvées', January 24-May 16, 2016. 'herman de vries. Aspekte des Werkes : Farbstiftzeichnungen', January 26-March 26, 2016. 'herman de vries "Bilder als Bilder" 1971-1972', February 12-26, 2016. 'herman de vries - selected works', March 4-May 14, 2016. 'herman de vries - basic values', March 26-April 17, 2016. Curated by Roel Arkesteijn. Also on view in Het Domein, Sittard (June 12-September 4, 2016). [with Silvano Tessarollo] 'Nulla nasce dal nulla di Silvano Tessarollo con un intervento di Herman De Vries', June 2-July 16, 2016. 'herman de vries - basic values', June 12-September 4, 2016. Curated by Roel Arkesteijn. Previously seen in Jakarta and Amsterdam. 'BorzoGallery presented herman de vries at Art Basel 2016', June 16-19, 2016. 'herman de vries. stein erde holz', June 26-October 9, 2016. The exhibition travelled to the Städtischen Galerie in Bietigheim-Bissingen (October 22, 2015-January 8, 2017). 'herman de vries. no beginning no end', September 10-October 16, 2016. Curated by Anna Maria Ehrmann-Schindlbeck. 'herman de vries. all in one - one in all', October 8-November 26, 2016. 'herman de vries. stein erde holz', October 22, 2015-January 8, 2017. The exhibition was also on view in Ingolstadt. 'herman de vries. arbeiten auf papier', October 28-December 11, 2016. 'Schaufenster Sohm VI - herman de vries', November 8, 2016-May 7, 2017. 'what is waste? what is art? what is life? ', January 8-February 6, 2016. Participating artists Dianna Cohen, Maarten vanden Eynde, Ryohei Kawanishi, Mierle Laderman Ukeles, Jan Eric Visser, herman de vries and Izaak Zwartjes. 'Dedans/Dehors', January 16-March 25, 2016. 'SoilCulture: Deep Roots', organized by the Centre for Contemporary Art and the Natural World, January 16-March 19, 2016. Participating artists Paolo Barrile, Mel Chin, herman de vries, Richard Long, Ana Mendieta and Claire Pentecost. The exhibition was also on view in the Falmouth Art Gallery from September 19-November 21, 2015. 'Top Hundred Maurizio Nannucci', February 2-April 23, 2016. In collaboration with Museion, Bolzano. Participating artists herman de vries, Vito Acconci, Laurie Anderson, Carl Andre, and many others. 'De quelques publications d'artistes – Collection du Cdla', February 4-May 1, 2016. The exhibition is organized by the Centre des livres d'artistes from Saint-Yrieix-la-Perche in cooperation with the CAPC musée d’art contemporain de Bordeaux. 'Concerning Concrete Poetry', February 5-April 3, 2016. Curated by Andrew Hunt and Anja Casser; participating artists Jiři Valoch, Paul De Vree, herman de vries, Emmett Williams, and many others. 'Fünfzig Zigarren für das Licht der Zukunft', March 5-September 25, 2016. Participating artists herman de vries, Uli Aigner, Art&Language, and many others. 'Es ist angerichtet! Der Geruch und die Kunst = Dig in! Scent and Art', March 31-April 24, 2016. Curated by Camilla Nicklaus-Maurer. 'Floralia', April 2-September 11, 2016. Participating artists Armando, herman de vries, Daan van Golden, and others. 'Zero and Now', April 23-June 19, 2016. Participating artists Adolf Luther, Armando, Bernard Aubertin, herman de vries, and others. From 13 to 15 May tribal art galleries in the centre of Amsterdam organised the yearly 'Amsterdam Trail', this time together with contemporary art galleries. 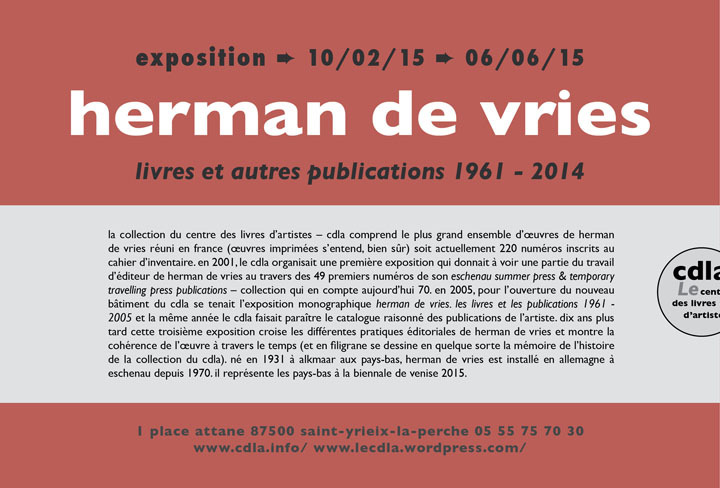 Work of herman de vries was on show in Galerie Lemaire. 'Unterwegs / on journeys', June 4-July 30, 2016. Participating artists herman de vries, Rosemary Laing, Boris Mikhailov and Sascha Weidner. 'Ritme & Regelmaat, 70 jaar abstractie in de kunst, 1945 - 2015', June 18-July 16, 2016. Curated by Diana Wind; participating artists herman de vries, Bernard Aubertin, Ad Dekkers, Jan Hendrikse, and others. 'System und/mit/oder Zufall', June 30-August 6, 2016. Participating artists Werner Dorsch, Gerhard Hotter, Michel Jouet, Jo Schöpfer and herman de vries. 'Young Collector's Choice 16', July 2-August 13, 2016. Participating artists herman de vries, Bernard Aubertin, Hans Jörg Glattfelder, Ewerdt Hilgemann, Heinz Mack, and others. 'Into Nature', July 2-September 18, 2016. As part of the exhibition series 'Into Nature' the museum exhibits work by Wolfgang Laib, Kim Habers and herman de vries. 'Pflanzenwelten II', July 5-August 28, 2016. Participating artists herman de vries, Horst Ziegler, Rainer Nepita, Helmut Droll, and others. 'I Went to the Woods. The artist as wanderer', July 23-November 6, 2016. Curated by Chris Clarke and Pádraic E. Moore. Artists: Anna Bak, Brendan Earley, Fiona Kelly, Juha Pekka Matias Laakkonen, Richard Long, Helen Mirra, Ria Pacquée, herman de vries, Walker & Walker. 'I still believe in Miracles. Celebrating 30 Years of Inverleith House, 1986 to 2016', July 23-October 23, 2016. 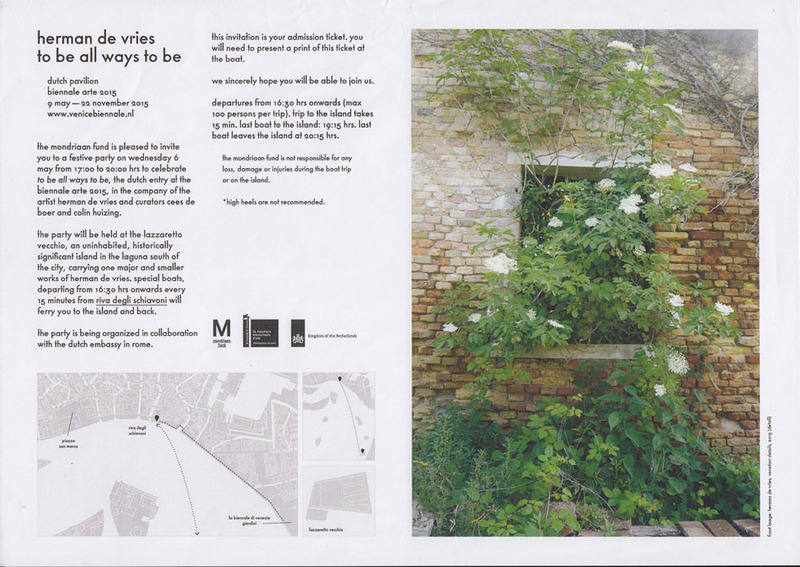 Artists include Lawrence Weiner, Richard Wright, Richard Tuttle, herman de vries and Andy Goldsworthy. 'Catching the Axis. Between the Sky and the Earth', August 21-September 10, 2016. Participating artists Jacek Tylicki, herman de vries, Yoko Ono, Mabelle Williams and others. '[un]erwartet. Die Kunst des Zufalls', September 24, 2016-February 19, 2017. 'harvest', October 2, 2016-March 5, 2017. Curated by Peter Foolen. Participating artists herman de vries, Thomas A. Clark, Alec Finlay, and others. 'Cabinet of Concrete Poetry', October 12, 2016—January 29, 2017. In collaboration with Zona Archives, Florence (Maurizio Nannucci). 'El curso natural de las cosas', October 14, 2016-January 8, 2017. Curated by Tania Pardo. Participating artists Adolfo Schlosser, herman de vries, Fernando García o Fernando Buenache, and others. 'Kunst in Europa 1945–1968. Der Kontinent, den die EU nicht kennt', October 22, 2016-January 29, 2017. Curated by Eckhart Gillen and Peter Weibel. Works by herman de vries, Marc Adrian, Yaacov Agam, Kurd Alsleben, and many others. 'Making Nature: How we see animals', December 1, 2016-May 21, 2017. Organised around four themes – 'Ordering', 'Displaying', 'Observing' and 'Making' – this exhibition questions the approach of 'learning through looking', charts the changing fashions of museum displays alongside society's changing attitudes to the world around us, examines the search for an authentic encounter with nature, and looks at how humans have intentionally altered other organisms. 'zero.0.nul', December 2, 2016-January 14, 2017. Selected works by Bernard Aubertin, Hermann Goepfert, Jan Henderikse, Oskar Holweck Heinz Mack, Christian Megert, Uli Pohl, Jean Tinguely, herman de vries and Herbert Zangs. 'Tant de Temps! 50 artistes contemporains au musée Soulages', December 3, 2016-April 30, 2017. Participating artists besides herman de vries, Christian Boltanski, Robert Filiou, Gerhardt Richter, Bill Viola and many others. 'Zeitlos gut! ', December 3, 2016-January 14, 2017. Selected works by Armando, Bernard Aubertin, Hans Jörg Glattfelder, Ewerdt Hilgemann, Heinz Mack, Christian Megert, Georg Karl Pfahler, Daniel Spoerri and herman de vries. 'herman de vries', January 14-March 4, 2017. 'herman de vries. on the stony path', March 9-July 1, 2017. Curated by Veronica Sekules. 'herman de vries. from earth: oberschwaben', March 18-June 11, 2017. 'herman de vries. from zero to zero', April 29-June 30, 2017.
herman de vries. chance and change', June 17, 2017-February 4, 2018. Curated by Kristine Guzmán. 'herman de vries. different & identic, works 1973-2016', September 8-October 15, 2017. 'herman de vries. the return of beauty', September 19-November 18, 2017. Curated by Francesca Pola. 'herman de vries', December 8, 2017-January 13, 2018. 'LET'S BUY IT! Kunst und Einkauf. 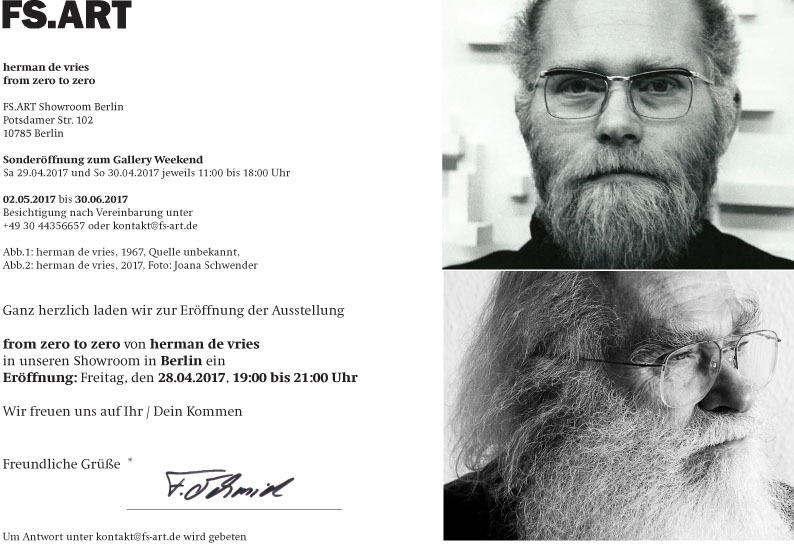 Von Albrecht Dürer über Andy Warhol bis Gerhard Richter', January 22-May 14, 2017. 'De tussentijd', April 1-November 5, 2017. Works by Arturo Hernández Alcázar, Song-Ming Ang, Massimo Bartolini, Joseph Beuys, herman de vries and many others from the collection of Museum Voorlinden. 'Kunst durch die Blume', April 1-October 29, 2017. Participating artists among others Daniel Spoerri, Katharina Duwen, Rozbeh Asmani, Rudolf Bonvie and herman de vries [from May 27 onwards]. 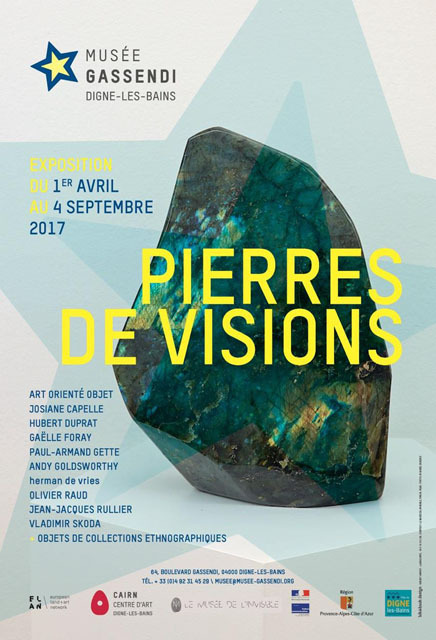 'Pierres des visions', April 1-September 4, 2017. Participating artists among others Andy Goldsworthy, Paul-Armand Gette and herman de vries. 'Nieuwe collectiepresentatie: De Tussentijd', April 2 onwards. Participating artists among others Joseph Beuys, Marinus Boezem, Marcel Broodthaers, Ad Dekkers, Louise Bourgeois and herman de vries. 'colour your world: a choice from the AA collection', April 8-29 April 2017. Curated by Alexandra Siebelink; participating artists Pieke Bergmans, Sjoerd Buisman, Ad Dekkers, Norman Dilworth, Ewerdt Hilgemann, herman de vries and Thomas Pihl. 'Socle du Monde Biennale 2017', April 21-August 27, 2017. Curated by Mattijs Visser, Jean-Hubert Martin and others. Each of the 5 curators will create their individual chapter, based on a work by Manzoni, while the 'outdoor' chapters with permanent installations will be curated by the complete team. herman de vries and 61 artists will participate. 'Serielle Formationen. 1967/2017. Re-staging of the first German Exhibition of International Tendencies in Minimalism', June 3— November 5, 2017. Curated by Renate Wiehager, curators in 1967: Paul Maenz and Peter Roehr. Participating artists Carl Andre (USA), Enrico Castellani (I), Jan Dibbets (NL), Dan Flavin (USA), Hermann Goepfert (D), Kuno Gonschior (D), Hans Haacke (D), Ewerdt Hilgemann (D), herman de vries (NL/D), and many more. 'Nach der Natur. Material, Form, Struktur', June 25-September 10, 2017. Participating artists Mirko Baselgia, Wolfgang Laib, Giuseppe Licari, Mario Reis, Rikuo Ueda, herman de vries and others. 'Pure Nature Art. Naturmaterialien in der zeitgenössischen Kunst', June 25, 2017-January 7, 2018. Participating artists Bethan Huws (GB), Christiane Löhr (DE), Alastair Mackie (GB), David Nash (GB, Abb. ), Regine Ramseier (CH) and herman de vries (DE/NL). 'Young Collectors Choice 17', July 17-August 19, 2017. Works by Hans Jörg Glattfelder, Heinz Mack, Christian Megert, Marcello Morandini, Richard Neuz, Otto Piene, herman de vries and others. 'Finders Keepers. The Life of Things', September 7, 2017-February 11, 2018. About collectors, collecting and collections, curated by MacGuffin. 'SHOWCASE - Künstlerbücher aus der Sammlung der Bayerischen Staatsbibliothek', September 20, 2017-Jabnuary 7, 2018. Participating artists Hans Bellmer, Eduardo Paolozzi, Louise Bourgeois, herman de vries and many others. 'Papier journal', October 4, 2017-January 27, 2018. 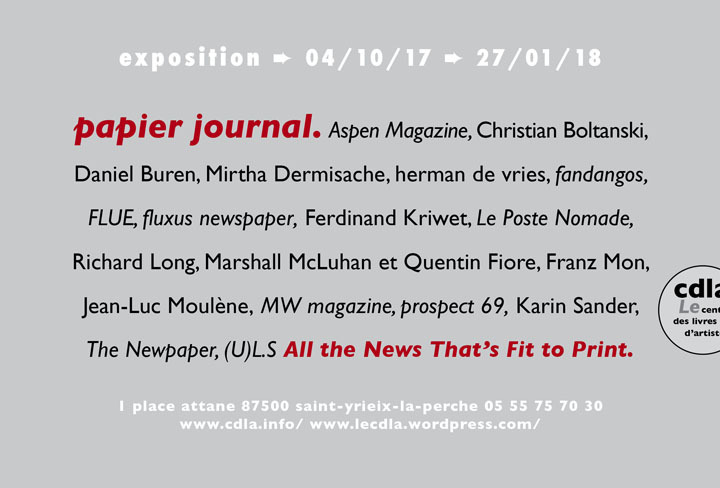 Participating artists Christian Boltanski, Danier Buren, herman de vries and others and journals als Aspen Magazine, fandangos and more. 'The Essence of Things', September 30-October 8, 2017. An installation of works by artists associated with Minimalism and Post Minimalism statements in the 1960s and 1970s, featuring Bernd Lohaus, Carl Andre, Fran&ccirc;ois Morellet, herman de vries, and others, curated by Daniel Marzona. 'schwarzweiss', November 1, 2017-January 20, 2018. Selected works by Martin Assig, Stephan Balkenhol, Alan Charlton, Jochen Flinzer, K.R.H. Sonderborg, David Tremlett, herman de vries and others. 'Zeitlos Gut! ', November 26, 2017-January 6, 2018. Participating artists Bernard Aubertin, Ewerdt Hilgemann, Daniel Spoerri, herman de vries, and others. [with Anne Geene] 'Natuurlijk! ', April 22-May 27, 2018. 'herman de vries. Taken from Nature: Artists Books, Editions, and Works on Paper. Works from the Collection of the Brokken Zijp Foundation of Art', May 4-October 21, 2018. 'herman de vries - erde, asche, blut', May 6-June 30, 2018. 'herman de vries. gavdos 34° 50', 24° 05' E : journal - plants - earth - stones', June 29-September 1, 2018. 'herman de vries. all all all', September 12-November 30, 2018. curated by Francesca Pola. 'herman de vries. oplage 0', October 13-November 13, 2018. The exhibition is part of the 'Week of the Artists' Book'. 'herman de vries. - ultimate free -', November 23-December 29, 2018. 'Ongeboden. 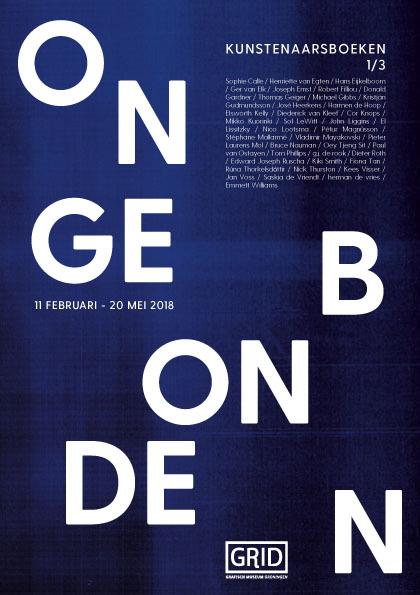 Kunstenaarsboeken 1/3', February 11-May 20, 2018. Participating artists: Sophie Calle, Henriëtte van Egten, Hans Eijkelboom [...] herman de vries, Emmett Williams. 'EH 80 Ewerdt Hilgemann', February 21-March 1, 2018. Ewerdt Hilgemann, a brief overview of his oeuvre on the occasion of his 80th birthday with works by friends Ad Dekkers, Marinus Boezem, Bob Bonies and herman de vries. 'Freiraum der Kunst - Die Studiogalerie der Goethe-Universität Frankfurt 1964–1968', March 18-July 8, 2018. 'Premier Rang : catalogues en tous genres', March 26-April 17, 2018. In cooperation with the Centre des livres d'artistes, Saint-Yrieix-la-Perche. Participating artists Laurence Aëgerter, herman de vries, Ewerdt Hilgeman and others. 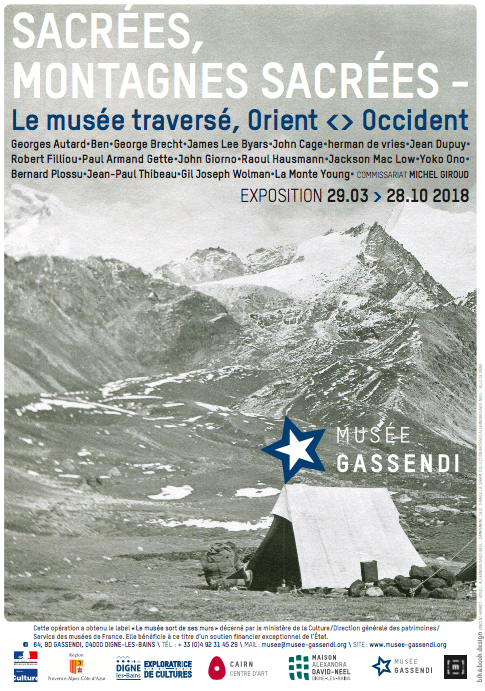 'Sacrées, Montagnes sacrées - Le musée traversé, Orient <> Occident', March 29-October 28 2018. Participating artists George Brecht, James Lee Byars, herman de vries, Paul Armand Gette and others. 'De(s) Rives', April 7-21, 2018. 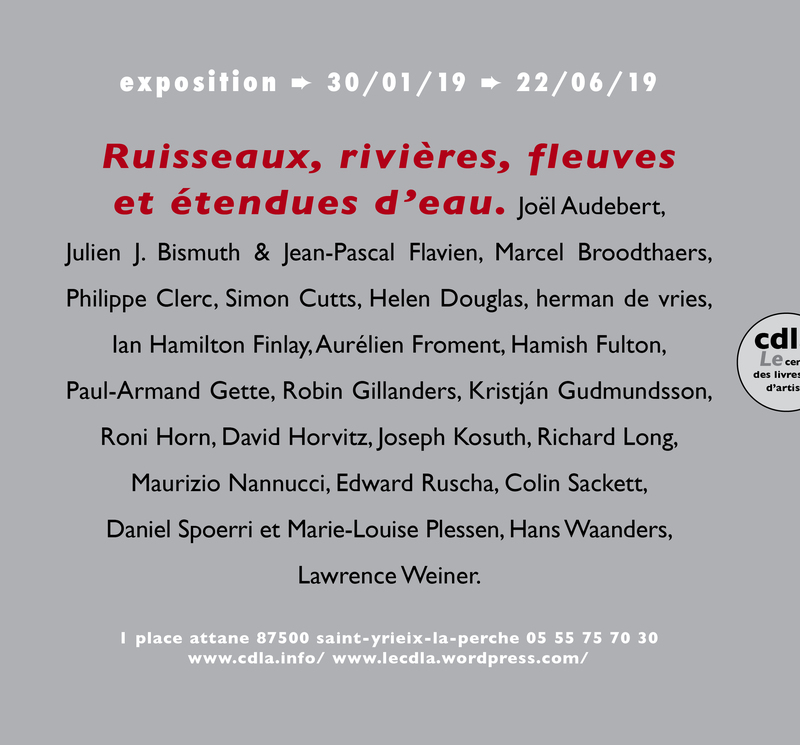 Touring exhibition, organized by Galerie Aline Vidal on the island of Saint-Louis, Paris; participating artists Benoît Pype, Thibault de Gialluly, Philippe De Gobert, herman de vries, and others. 'From ZERO to 2018', April 14-May 19, 2018. Participating artists Ad Dekkers, Constant Dullaart, herman de vries, Jan Robert Leegte, Jan Schoonhoven, Marc Bijl, and Rafaël Rozendaal. 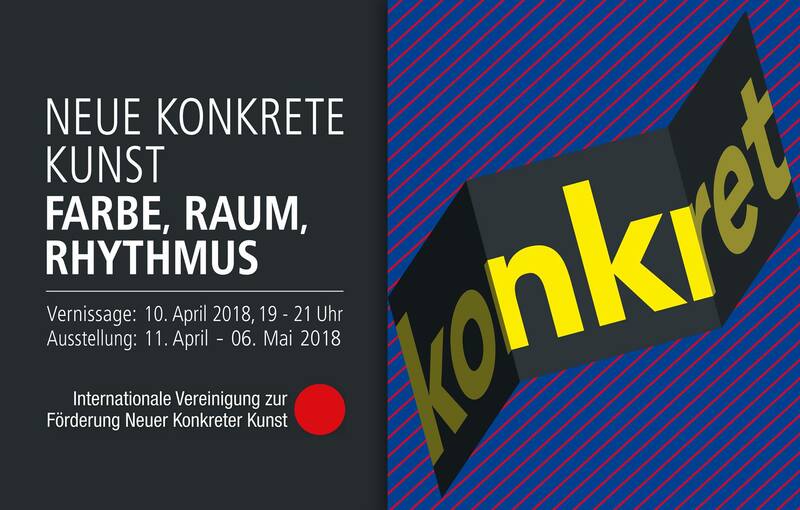 'Neue konkrete Kunst – Farbe, Raum, Rhythmus', April 11-May 6, 2018. Participating artists herman de vries, Ilse Aberer, Edgar Diehl, Werner Dorsch and others. 'Light and Movement in European Post-War Art', May 22-July 20, 2018. Exhibition coordinator Ottavia Fontana, participating artists Piero Dorazio, Lucio Fontana, Jan Henderikse, Walter Leblanc, Heinz Mack, herman de vries, and others. 'vielschichtig', May 26/27-November 18, 2018. Participating artists Hartmut Böhm, Ad Dekkers, Eberhard Fiebig, herman de vries, and others. 'Äpfel und Birnen und anderes Gemüse. Die Obstbilder von Korbinian Aigner im Dialog mit der Sammlung Würth', June 18, 2018-January 6, 2019. 'ars longa, vita brevis', from June 23, 2018 onwards. The new collection presentation of Rijksmuseum Twenthe will be held with a main focus on 'the human condition'. The Human Life in nine episodes with nine artists to participate in this project: Bart Hess, L.A. Raeven, Berend Strik, Philip Vermeulen, Anne Wenzel, Peter Zegveld, Karin Arink, Armando and Silvia B. Anne Wenze; selected the work '108 pound of lavendel'. 'Eén. Recente aanwinsten voor de collectie hedendaagse kunst', September 16-December 2, 2018. Participating artists among others Melanie Bonajo, Ricardo Brey, Mark Dion, Joseph Semah en herman de vries, curator Roel Arkesteijn. 'Soundlines of Contemporary Art', September 25-October 25, 2018. The exhibition is part of the International Contemporary Art Exhibition: Armenia 2018 (ICAE2018). Participating artists Rossella Biscotti, Alighiero Boetti, Christian Boltanski, Maurizio Cattelan, Loris Cecchini, herman de vries, and many others. 'het Boek der Natuur. Kunstenaarsboeken over het belang van de natuur', October 13-November 17, 2018. Participating artists among others Martin Brandsma, Sjoerd Buisman, Hamish Fulton, Anne Geene, herman de vries and Luuk Wilmering. Curated by Henk Woudsma. The exhibition is part of the 'Week of the Artists' Book'. 'Lehmarchitektur heute. Ein traditioneller Werkstoff für die Zukunft', October 19, 2018-January 6, 2019. 'Räume für Bäume', November 17-December 8, 2018. Participating artists Karl Bohrmann, Lucia de Figueiredo, Barbara Klein, herman de vries a.o. 'Zeitlos Gut! ', December 2, 2018-January 5, 2019. Selected works by Bernard Aubertin, Ewerdt Hilgemann, Christian Megert, herman de vries and others. 'Gérard Traquandi & la Donation Albers-Honegger', April 6, 2019-April 5, 2020. 'four visions on the landscape : Jerry Veldhuizen, Roman Peter, Eric Snell, herman de vries', March 30-April 28, 2019. 'Manzoni in Holland', February 16-June 2, 2019. Curated by Colin Huizing; participating artists besides Manzoni: Marina Abramovic/Ulay, Armando, Marinus Boezem, herman de vries and many others. 'Ding / Unding. The Artist's Book Unbound', February 13-April 14, 2019. Curated by Lena Schaller. 'natural', January 31-March 9, 2019. Works by Martin Assig, Olav Christopher Jenssen, Roman Kochanski, Wolfgang Müller, Claudia Pegel, Peter Rösel, David Tremlett and herman de vries. 'Ruisseaux, rivières, fleuves et étendues d'eau', January 30-June 22, 2019. Participating artists Simon Cutts, Ian Hamilton Finlay, herman de vries, Lawrence Weiner and many others. 'De naakte waarheid' [= The Naked Truth], January 26-June 16, 2019. Participating artists Marina Abramovic, G.H. Breitner, Berlinde de Bruyckere, Jan Sluijters, herman de vries, Andy Warhol and many others. 'Stil', January 26-July 14, 2019. Participating artists Steven Aalders, Jasper van Aarle, Marina Abramovic, Philip Akkerman, herman de vries and others.